Status such as this were found in the Tomb of King Tut designed to guard the tomb. This amazing statue is life size - a full 72 inches high. It is beautifully detailed in black and gold. 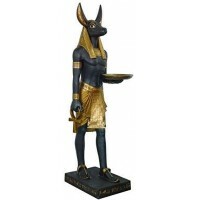 In one hand, he holds an Ankh, the Divine Symbol of Life, in the other an offering tray making him perfect in an entry way or temple - a truly unique work of art! For indoor use (or outdoors under shelter - direct sunlight can cause fading and exposure to the elements can cause breakage over time). Made of cold cast resin reinforced with fiberglass and wood, he will last a lifetime. Due to the size and weight of this amazing statue, it must be shipped via truck so can only be delivered within North America. Note that this item is NOT eligible for free shipping and will be shipped separately from any othe items. A delivery quote to your exact destination will be provided after you order it. It will delivered via freight truck (with an optional lift gate), but we highly recommend you have some strong helpers to uncrate and move it after delivery. It ships in 2 boxes on a pallet and a forklift can be used while its on the pallet. Ships FOB from California. Actual weight is about 85 lbs. Item Number: PT-9180 | Approximate Size (Inches): 36.00 wide x 48.00 deep x 72.00 high | Approximate Shipping Weight: 105.00 lbs. Cold Cast Resin Resin is a polymer which can be used for making molds as well as cast in molds. Cold-cast resin is generally for sculpture and means that the resin material is cast without the need for the extreme heat of a foundry. It holds very sharp detail when cast. Most of the major lines of figurines on the market today are made of cold cast resin. It is fragile if dropped and fractures similar to glass, usually in clean pieces which can be glued using a household super glue. Large pieces are often cast in resin over a skeleton of wood and/or fiberglass for extra strength.